Oscar Toney, Jr. grew up in the forties in Columbus, Georgia. He began singing with local Gospel quartet The Sensational Melodies Of Joy while barely into his teens. Young Oscar won the amateur competition at the landmark Liberty Theater so many times that he wasn't allowed to enter them anymore. 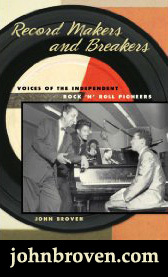 By the late fifties, The Sensational Melodies took to singing doo-wop as well, calling themselves, simply, The Melodies. In 1958, Toney and his two brothers formed another vocal group called The Valentines, eventually changing their name to The Searchers, as their own version of the Coasters' Searchin' had become their signature song. 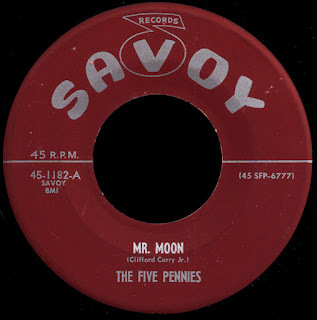 They recorded one single for the tiny Mac label in 1960. That label was owned by a local entrepreneur named Donald 'Cement' MacNally, who owned a popular nightspot, The Club C'estbon. He was also the leader of the 'house band', The Kayos. 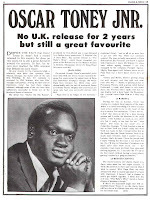 Cement recruited Oscar to help fill in with the group here and there, and by the early sixties, he had become a regular member. 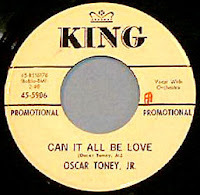 In 1964, Toney, who was already writing his own material, hooked up with Macon record man Bobby Smith who would lease Can It All Be Love to King. The record didn't do much. The Dothan Sextet, the R&B powerhouse that (as we discussed last week) was headed by James & Bobby Purify, performed regulary at another Columbus watering hole, the Club Lavanna. Just as Mighty Sam McClain had done, Oscar began singing with the group from time to time, and after James and Bobby left to sign with ol' Papa Don, his performances with them became more and more frequent. According to Oscar, Papa Don saw him with the Sextet one night in Pensacola, and offered him a contract. Schroeder (quoting, once again, from the Sundazed interview) remembers it differently: "...in walks this guy named Oscar Toney, Jr. He comes to my kitchen, and my cooks hadn’t shown up that day, and I’m back frying chicken. And this guy walks in wearing a beautiful, full length, black, leather coat. Nice looking guy. And he says, ‘Papa Don? Mighty Sam sent me, and I’m Oscar Toney, Jr. And I want to cut a hit record for you.’ I said, ‘Man, I’m sorry, I just don’t have time to listen now. But if Mighty Sam sent you, I know you’re great.' I had a tremendous amount of respect for Mighty Sam. 'But I will commit to try you out in a couple of weeks, and if I like it, we’ll cut a couple of sides on you. 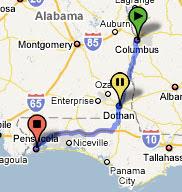 I’m going to be in the studio with the Purifys’ on such and such date in Memphis. You meet me in there'..."
As it turned out, Papa Don was in the middle of the four or five day black-beauty fired marathon session on the Purify's Shake A Tail Feather when Oscar showed up. He waited. Then he waited some more. Once Schroeder noticed him, he said "‘Oh, yeah. Oscar.’ The guys were tired. And I said, ‘Wait a minute, man. Let’s listen. Oscar’s still sitting here waiting.’ Everybody’s about to die, wanting to take a break. I said, ‘Oscar, step up to that microphone right there, guy... I want you to sing me the greatest old song that you know...' He said, ‘Well, I wrote this little recitation to go with an old Jerry Butler song...’ and he stood up to that microphone and he started this little rap... Bobby [Emmons] joins in while he’s doing that little recitation on the front. The guys kick in. This is starting to sound good! I said, ‘Go back to the top and let’s try this again, Oscar.’ He starts, the whole band kicked in, and we cut a smash version of ‘For Your Precious Love’... and we cut it in 15 minutes. He just stood up to the mic, and sang the song one time and I couldn’t find a thing I wanted to change. That was one of those great rare one-take performances in the record business that you hear about. Unbelievable. It was absolutely unbelievable. I’ll never forget it." As legend has it, Papa Don then put a phone call through to Larry Uttal in New York in the wee hours of the morning. Papa Don: "Dan Penn was there at American Studio when I was cutting ‘Shake A Tail Feather', and he said, ‘Papa Don, I just cut a dynamite record, and I sure hope you’ll try to get me a deal...' I owed him, man - he and Spooner wrote the biggest record of my life... I said, ‘Dan, it’s a done deal, but I can’t listen to it ‘til I get through...’ He said, ‘Alright, I’ll be right here.’ Well, man, by the time I finished with [the session] old Dan’s still there, and he reminded me, ‘Pop, you gonna hear my record?’ Well, I’m on the phone calling Larry Utall... and Dan, by this time…is out of his gourd. I get Larry on the phone . ‘Hey Larry, Papa Don... I’ll tell you what - I think I’ve got us some records...’ and I played him ‘Shake A Tail Feather.’ He went bananas. This is 2:30, maybe three o’clock in the morning. ‘I signed us another act.’ He said, ‘Yeah? 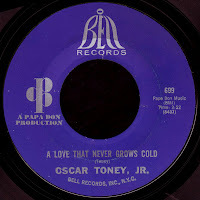 What’s his name?’ I said, ‘Oscar Toney, Jr.’ ...what a wonderful name for a soul artist. And then I played him ‘For Your Precious Love.’ And he said, ‘Wow!’... then I told... Chips to cue up Dan’s record. Now remember, I hadn’t even heard it yet. I said, ‘Hey, Larry, I want you to know I picked us up another record. And he said, ‘Yeah? 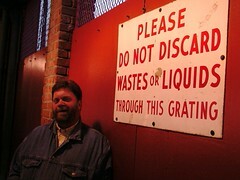 Well, what’d we pay for it?’ I said, ‘800 bucks and eight percent.’ He said, ‘Great! I’ll be down there next week, and I’ll close the deal for it then.’ I said, ‘Here, let me play it for you: 'Lonely days are gone, I’m-a goin’ home, ‘cause my baby just wrote me a letter'…'The Letter' by the Box Tops! Is that a funny story?" 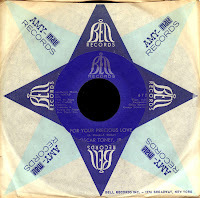 It sure is Papa Don, and when For Your Precious Love (now up on The A Side) hit #4 R&B only two weeks after Shake A Tail Feather had climbed to #15, Uttal was pretty happy. He was downright ecstatic when The Letter spent an entire month in the number one spot on the Pop charts later that summer. That was some phone call! A phone call that put Chips Moman and his American Studio squarely on the map, once and for all (Atlantic would have Esther Phillips recording there within a month). Oscar puts me in mind of O.V. Wright here, with his soulful Gospel edged vocals... I love that opening scream! 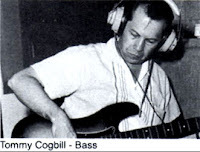 Tommy Cogbill shows why he was considered the best bass player around in those days, just listen to him burn it up, man! Incredible stuff. As the guy who held down the bottom on so many great soul records, he never received the credit he deserved. If you look closely at the label, you'll notice that production credit is shared by 'Papa Don, Cogbill, Emmons, Chrisman & Young'. Truly a group effort, I think Schroeder really appreciated the contributions of the guys in the studio, and realized that he couldn't do it without them. Also listed on the label (in addition to Moman) is an engineer named George Schowerer. As it turns out, George was the engineer at Mira Sound in New York City, a funky little studio set up in an old restaurant in the basement of the decidedly greasy Americana Hotel. This is where Papa Don overdubbed the background vocals, with his Brill Building trio of Ellie Greenwich, Doris Troy and Melba Moore. A pretty amazing record. 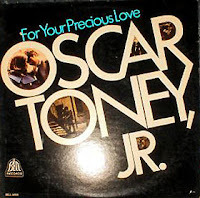 They brought Oscar back into American to cut the rest of the tracks for an LP that capitalized on the strength of his top five single, and his versions of those Penn/Moman chestnuts Dark End Of The Street and Do Right Woman - Do Right Man (if a little heavy on the strings) are worth the price of admission. 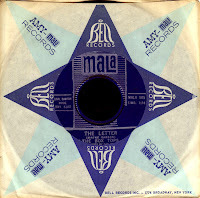 A single pulled from the album, a cover of Turn On Your Lovelight, broke the R&B top 40 in the fall of 1967. By the end of the year, the friction between Chips Moman and Papa Don was coming to a head. 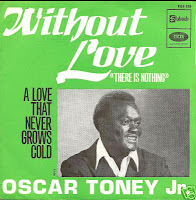 Without Love (There Is Nothing) would crack the R&B top 50 in early 1968. A 'Papa Don Production', it was probably recorded in Florida. Toney wasn't happy with the results, saying "Papa Don had his own studio in Pensacola, but he could never come up with the right sound... Chips had professional musicians, and he could engineer that board. He could get that mix. Papa Don was trying to do that for himself, but he just couldn't." 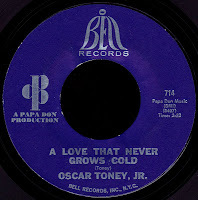 Adding to the widening gulf between the two men was, I believe, the fact that Oscar's own excellent compositions (like A Love That Never Grows Cold) were perennially issued as B sides, and he just wasn't getting the appreciation he felt he deserved. According to Papa Don, "...a few months later, Oscar called me... and he says ‘Pop, I quit! I just don’t like being on the road all the time.' I couldn’t believe it!" But, according to Oscar, "I'd had about as much as I could stand, him disrespecting his artists... the only way I knew to hurt him was through the pocket. I had to sacrifice myself to hurt him." Be that as it may, the body of work these two men created has stood the test of time. 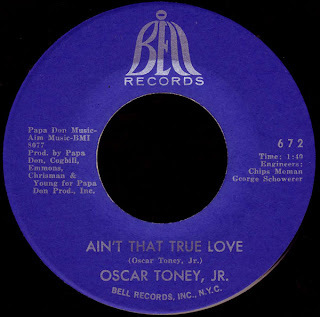 Bell would release a few more singles on him 'out of the can', but Toney would never chart again. He signed with Phil Walden's Capricorn label in 1970, and although they would issue four singles (with a fifth being picked up by Atco), his career was at a standstill. Still a favorite overseas, he was signed by the UK based Contempo label, where he would release a critically acclaimed album, I've Been Loving You Too Long, in 1975. 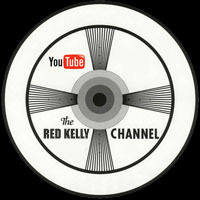 The label would release two singles as well, but they failed to connect with an audience, especially back in the States. By the end of the decade, he had returned to his roots in Gospel music and got a 'day job' back in his old hometown, leaving his life as a soul singer behind him. 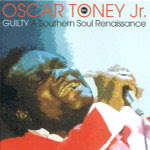 In 2000, Oscar returned to the studio in Atlanta with producer Bob Grady for a 'Southern Soul Renaissance'. The album they came up with, Guilty, has recently been re-issued by Shout. As far as I can tell, he still performs locally down south. Nice one Red! One of my all time fave southern soul sides.